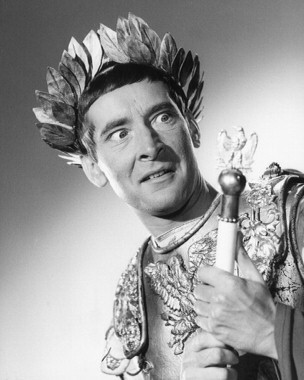 Kenneth Williams as Caesar in "Carry On Cleo"
The joke (you can find it in Macrobius’ Saturnalia, book 2) fell somewhat flat when repeated at Grad Tea yesterday. True, this was something to do with yours truly forgetting the punchline (the shame..), but even when repeated correctly we had to agree that something had been lost over the past two thousand years, or it had never been really funny in the first place. I wondered how the joke had been received on its first telling (assuming that the anecdote wasn’t fictional). 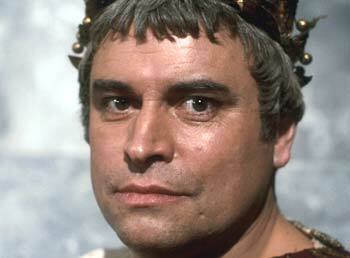 Was this a jolly episode of a benign, twinkly-eyed Augustus – Brian Blessed in I, Claudius – having a gentle laugh with his courtiers at the slave’s expense? In other words, a genuinely amusing event? Or was this a more cold and intimidating Augustus – Simon Woods in Rome – whose rather flat joke was immediately met, like a Bond villain’s, with gales of over-loud laughter? Or something in between? More generally, why collect jokes like this in the first place? Why tell a story about a wisecracking emperor? 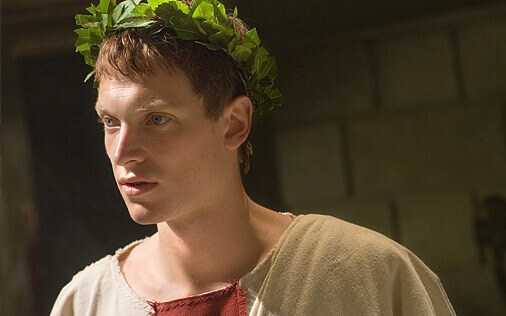 Brian Blessed's cuddly Augustus from "I, Claudius"
Simon Woods as a more sinister Augustus in "Rome"
But of course, we know that Julia was not allowed to make fun of the emperor forever. 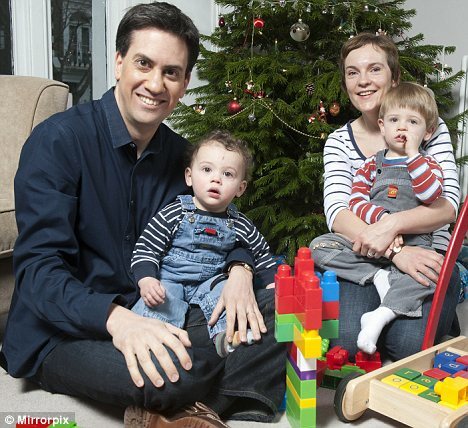 (All together: ‘IS THERE ANYONE IN ROME WHO HAS NOT SLEPT WITH MY DAUGHTER??! !’) Is the point about an emperor’s jokes that the he always gets the last laugh, or just the laugh, even when the joke isn’t funny? Or is it more than that: when you don’t have a choice not to laugh, there really is no joke. In fact the joke is on you, for colluding in the charade. Rather than participating in a humorous moment between equals, you’ve become little more than a laughter track. And the reader of Macrobius knows that at least Augustus’s ‘jokes’ were harmless. What about the ‘little jokes’ of later, more unstable emperors – say Caligula’s brothel on the Palatine? What does your forced laughter mean then? In fact, we might conclude that what we learn from a collection of imperial jokes is that an emperor can’t joke – not like you or me. Anecdotes like this only serve to underscore the difference between ruler and ruled, just like those posed shots of open-neck-shirted politicians with their families that only serve to make them seem more artificial. The imbalance of power distorts normal social relations to such an extent that even this basic form of interaction is stilted. It’s artificial: just like your supposedly personal encounter with him, in fact prompted by a slave. Tags: Augustus, emperor, I Claudius, joke, Julia, Julio-Claudian family, Macrobius, Rome. Bookmark the permalink. I like the idea that if the joke was cracked then it was cracked in a Kenneth Williams-esque way, that would be amazing.